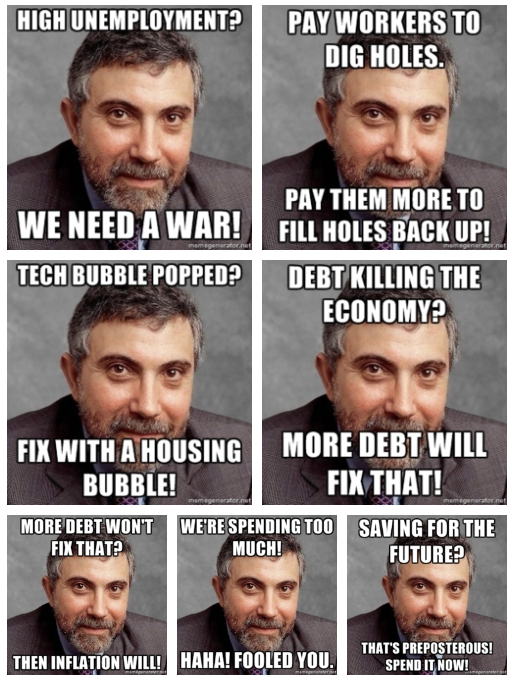 I’m tempted to feel a certain degree of sympathy for Paul Krugman. As a leading proponent of the notion that bigger government stimulates growth (a.k.a., Keynesian economics), he’s in the rather difficult position of rationalizing why the economy was stagnant when Obama first took office and the burden of government spending was rising. And he also has to somehow explain why the economy is now doing better at a time when the fiscal burden of government is declining. But you have to give him credit for creativity. Writing in the New York Times, he attempts to square the circle. Let’s start with his explanation for results in the United States. …in America we haven’t had an official, declared policy of fiscal austerity — but we’ve nonetheless had plenty of austerity in practice, thanks to the federal sequester and sharp cuts by state and local governments. 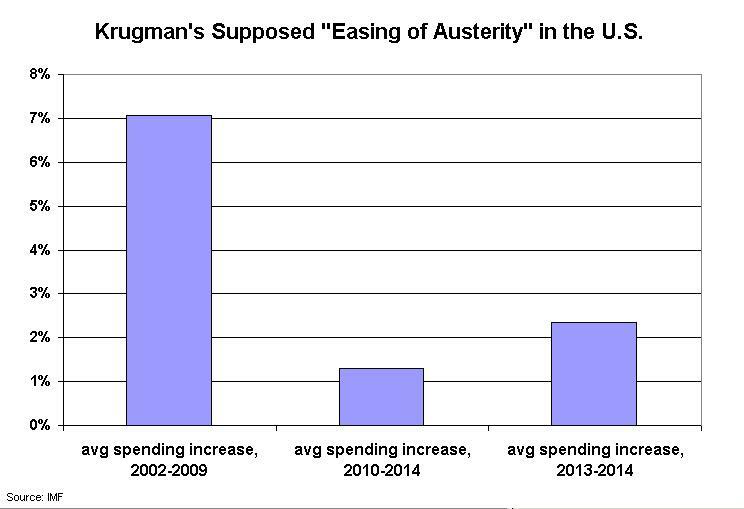 If you define “austerity” as spending restraint, Krugman is right. Overall government spending has barely increased in recent years. But then Krugman wants us to believe that there’s been a meaningful change in fiscal policy in the past year or so. Supposedly there’s been less so-called austerity and this explains why the economy is doing better. The good news is that we…seem to have stopped tightening the screws: Public spending isn’t surging, but at least it has stopped falling. And the economy is doing much better as a result. We are finally starting to see the kind of growth, in employment and G.D.P., that we should have been seeing all along… What held us back was unprecedented public-sector austerity…now that this de facto austerity is easing, the economy is perking up. But where’s his evidence? Whether you look at OMB data, IMF data, or OECD data, all those sources show that overall government spending has been steadily shrinking as a share of GDP ever since 2009. And deficits also are shrinking as a share of economic output according to all these measures, so there’s still “austerity” regardless of whether we’re looking at the underlying disease of government spending or the symptom of red ink. I sliced and diced the data to see if there was some way of justifying Krugman’s hypothesis and the only numbers that are (vaguely) supportive are the ones from the IMF that show total government spending (federal, state, and local) has increased by an average of 2.3 percent annually over the past two years, after increasing by 1.3 percent per year over the prior three years. But if that’s his definition of victory, then I’m more than willing to let him be the winner. If we can constrain the public sector so that it grows at 2.3 percent annually, we’ll be complying with my Golden Rule and the burden of government spending will continue to slowly but surely shrink as a share of GDP. And we’ll definitely have much better fiscal policy than we had between 2002-2009, when overall government spending rose by an average of 7.1 percent annually. 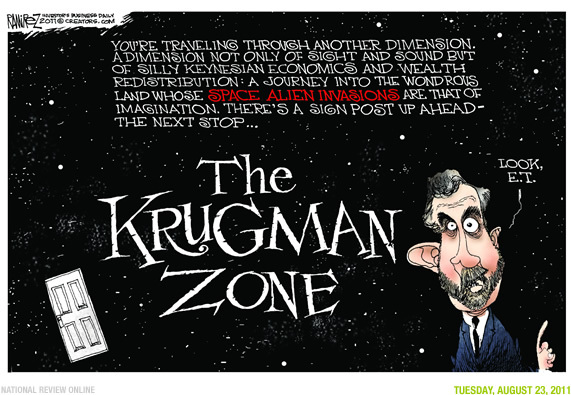 So does this mean Krugman and I are on the same page? 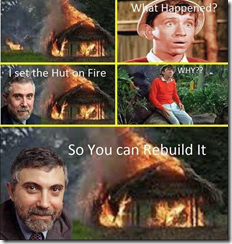 During the Los Angeles riots in 1992, Rodney King famously asked, “Can we all get along?” Assuming Krugman is being serious, the answer in late 2014 is yes. It’s time to join hands and sing Kumbaya! But you may sense a slight tone of sarcasm in my remarks, and that’s because Krugman surely doesn’t want government to “only” grow by 2.3 percent annually. He simply wants to justify his hypothesis that the economy’s improving performance is somehow due to less austerity. Even if that means he’s implicitly endorsing genuine spending restraint. 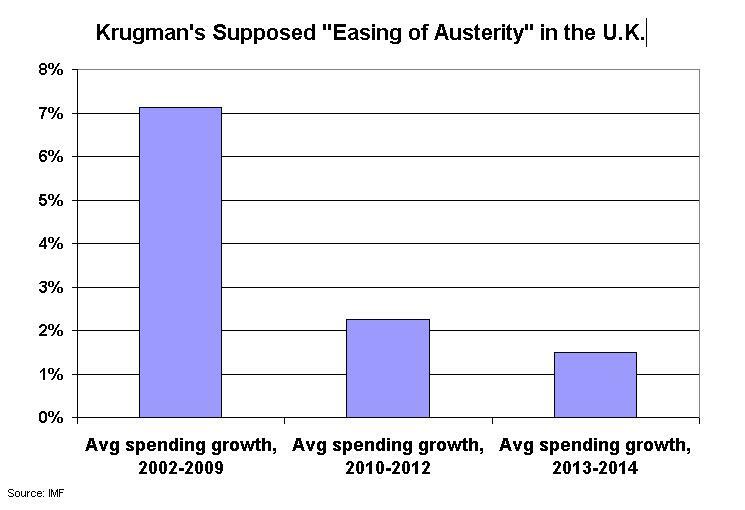 In other words, Krugman actually is being slippery and misleading in his analysis of American austerity. But that’s nothing compared to his analysis of so-called austerity on the other side of the Atlantic Ocean. Here’s some of what he wrote about fiscal policy in the United Kingdom. …in 2010 Britain’s newly installed Conservative government declared that a sharp reduction in budget deficits was needed to keep Britain from turning into Greece. Over the next two years growth in the British economy, which had been recovering fairly well from the financial crisis, more or less stalled. In 2013, however, growth picked up again — and the British government claimed vindication for its policies. Was this claim justified? No, not at all. What actually happened was that the Tories stopped tightening the screws — they didn’t reverse the austerity that had already occurred, but they effectively put a hold on further cuts. …And sure enough, the nation started feeling better. Well, the IMF numbers show that overall government spending has been growing, on average, by 2 percent annually since 2009. By today’s standards, that’s a decent record of spending restraint. But what if we dissect the numbers? Did spending grow very slowly between 2010-2012, followed by a relaxation of restraint beginning in 2013? In other words, is Krugman’s argument legitimate, even if it requires him to implicitly endorse (as in the American example) decent fiscal discipline over the past two years? Nope. Instead, the numbers show just the opposite. Between 2010-2012, the burden of government spending expanded by an average of 2.3 percent per year. But over the past two years, the “austerity” has become tighter and the budget has grown by 1.5 percent annually. In other words, it seems that Krugman is either sloppy or mendacious. Though I’m going to give him an escape hatch, a way of justifying his assertions. When the Tories took over in the United Kingdom, they quickly imposed a series of tax hikes (in addition to the tax hikes imposed by the outgoing Labor government). But since that time, the government has implemented some tax cuts, most notably reductions in corporate tax rates and lower tax rates on personal income. So if Krugman wants to argue that tax increases retarded the British economy for a few years and that tax cuts are now helping to boost growth, I’m willing to give him a probationary membership in the supply-side club. But I don’t expect him at the next meeting. P.S. This isn’t the first time Krugman has mangled numbers when analyzing U.K. fiscal policy.